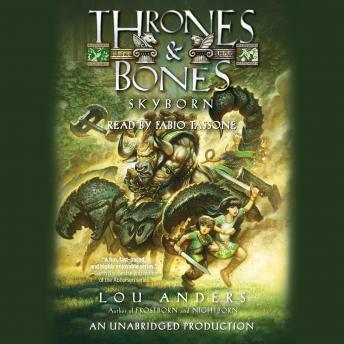 For fans of Lloyd Alexander and Brandon Mull comes the epic conclusion to the acclaimed Thrones and Bones fantasy-adventure trilogy that began with Frostborn. Find the Horn. Free the City. The chase continues for the legendary Horns of Osius. Thianna and Karn’s quest to retrieve the horns from those who wish to abuse their power takes them to Thica, an ancient land where two tyrant queens reign supreme and where years earlier Thianna’s mother was labeled a traitor. Soon the two heroes are caught up in an epic battle for control of the kingdom, one that puts their very lives at stake. The only way to overthrow the queens is to beat them at their own game. But with an entire empire against them, how can Karn and Thianna hope to compete—or better yet, survive? The Skyborn audiobook includes instructions for playing the board game Queen’s Champion, a Thican timeline, maps, and a glossary on a bonus PDF. King Herakles Hammerfist’s recipe for the Best Spanakopita Ever is recorded at the end of the program.